A blog for Small Business Consultants and the vendors who serve them. It contains Opinions on business success, News in the SMB consulting space, and Information on what I'm up to. All material Copyright (c) 2006-2019 by Karl W. Palachuk unless otherwise noted. Last week I posted Video#1 about hiring your first employee. You can read that blog post here. This week I posted Video #2. It's about practical advice that you need to consider. After all, the biggest move you'll ever make in a micro business is to more from one person (you) to two people. That's a 100% increase in personnel, with significant increases in salary, complexity, and commitment. LOTS of people have done this, and you can to. Here are some tips to make sure you don't end up make some big mistakes. Don't forget to subscribe to my YouTube Channel. And leave your feedback! IT Sole Proprietor? We Got Your Office Christmas Party Here! - all from the comfort of your own office! Join me and Harry Brelsford from SMB Nation - Live Thursday at Noon Pacific! Here's how. Many of us work alone or in small companies with no scheduled holiday office party. This is your chance to join in the merriment with SMB Nation and celebrate the season. It's all goodness as Harry Brelsford and special guests lead a Geek Trivia Contest. Winners will receive prizes. Everyone will leave richer and more knowledgeable than when they arrived. It's all packed into one hour of fun. Don't miss the stress-free, safe gathering of worldwide MSPs having a great time. Sure to be an annual tradition. Be sure to plan on taking a selfie and posting to the SMB Nation Facebook page during the event to qualify for yet more prizes. I just posted my latest SOP Video: Hiring Your First Employee (part 1). Most technology consultants make the mistake of thinking their job is about technology - so they assume their first hire will be a technician. I've blogged in the past about hiring a great administrative assistant. I call it your $200 Miracle. The other temptation is to hire a sales person. But 99% of the small businesses who want to hire a sales person are not able to support a sales person. Check out the video for my strategy for growing a team strategically. You only need three key people until you are supporting 500-1,000 desktops. You can check out all my videos on my YouTube channel at https://www.youtube.com/smallbizthoughts. Your feedback is always welcome! Got a note from my friend Jay McBain over at ChannelEyes (www.channeleyes.com) about a new project they're announcing. Check out the video. If you are a vendor in the MSP or SMB space, this might be just the tool for you. If you're an IT Pro and think you vendors could use this, please pass it along. TROY, NY — December 10, 2015 — ChannelEyes, the leading cloud-based channel sales acceleration and partner enablement company announced today the launch of OPTYX. It is a new predictive scoring and prioritization solution that helps channel organizations accelerate sales by optimizing partner interactions based on data science. The new platform automatically and intelligently processes internal and external data signals to help channel sales account managers work smarter, close more deals faster and continuously grow revenue. OPTYX has been designed to deliver a 20 percent increase in sales. The solution is a first-of-its-kind, self-learning predictive analytics engine that processes massive and complex data sets to create simple alerts and notifications that drive channel partner and alliance sales. OPTYX was developed by a team of top data scientists processing transactional, behavioral and big data sets from hundreds of data signals across dozens of sources. It brings together the most important information about an indirect partner sales channel, and then uses data science to produce partner insights and visibility a channel seller can act on. OPTYX makes it possible to engage with channel partners and alliances in more productive and meaningful ways. Internal and external data signals are leveraged to generate alerts and notifications, and then OPTYX calculates and prioritizes the optimal order and assigns the workflow. The channel account manager takes action on the prioritized list and is assisted with detailed call agendas and partner report cards. OPTYX is now available globally for vendors, manufacturers, OEMs and Distributors in all industries. I was thinking the other day about how many people have read or heard my advice over the years - and how many ignore it. My advice isn't any better than anyone else's advice. But I'm rarely alone in the advice I give. 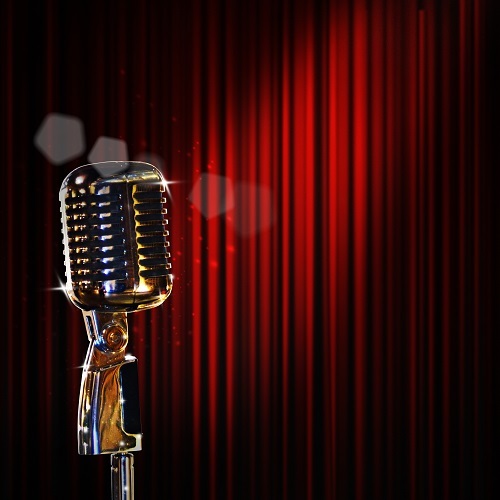 From the earliest days of writing, coaching, and speaking in the SMB / Managed Services arena, I've frequently been part of the chorus giving very similar advice. There are a handful of things that stand out, though. Here are five pieces of advice that have always worked out well for those who have taken the advice and implemented it. Four of them are very familiar to you. One is probably not. First: Get Paid in Advance for Everything. This single piece of advice can dramatically improve any business. Really. It is powerful and profound. It can eliminate cash flow problems. It is easy to implement and you really won't get any push-back. The main reason people do not attempt to get paid in advance is fear. They fear clients won't like it, won't put up with it, won't change their ways, etc. In reality, clients say, "Oh. Okay." And that's it. Virtually everyone I've talk to who moved to getting paid in advance had zero push-back from clients. The easiest thing you can do to make more money is to raise your rates. Simple, right? So why haven't you done it? Again, fear is the big culprit here. I recently announced that we are raising our rates in January. Not one word from any clients. No arguments. No defections. No one is going to run down the street over a $10/hr increase. Especially those on managed services who buy very few hours. You should get in the habit of raising your rates every year. January 1 is a very convenient time. If you want to go with inflation, then 1-2% is enough. I like nice round amounts, so I raise $5 or $10/hr. If you haven't raised raised in awhile, make it at least $10/hr. I think I will always have an admin no matter what I do or how long I live. AA's make work disappear. They make time magically appear. And they do a great deal of work for a small amount of money. You should do the work to determine your actual cost per hour. If you pay yourself $50,000 in salary, that's about $25/hr. Your overhead for the business is probably in the range of $20-25/hr. So the actual cost for you to sit around doing something is around $50/hr. When you spend lots of time on low-priority work that has to be done, you increase the cost of your billable time significantly. Hire an admin. Make a list of all the things then can do, and spend your time on high-importance items instead. You need time to sit quietly - alone - and work ON your business. Whether it's meditation, prayer, or just sitting quietly and organizing your day, this time is more valuable than anything you do on a regular basis. We have a tendency to "plug in" first thing in the morning and stay plugged in all day. Un-plugging and taking time to relax while you're still awake and alert can do wonders for your business and your life. I challenge you to meditate for five minutes every day for a month. Just sit quietly and try to clear your mind. I know it sounds strange if you haven't done it, but it really works wonders. The reason is simple: Our brains are constantly working. Even if we're not aware of it, they are working to solve our problems. When we shut up and listen, we discover that our brains have been working hard to put things in perspective and make connections we're not aware of. Again, whenever I talk to someone who has tried this, they have become hooked. It doesn't take time, it gives time because the rest of your day is more organized and focused. Unlike the other four, I don't give this advice to everyone. But I have given it. And it is most often ignored for obvious reasons. Sometimes you need to face the hard reality that this thing you call your business is not working out. Maybe you don't want to pay attention to money. Maybe you are bad at sales. Maybe you just aren't willing to make the changes that will make the difference. Sometimes businesses just don't thrive. Some thing is not configured right. Some people do not have the "owner's" mentality. Some people can't make decisions. Some people don't want to change. 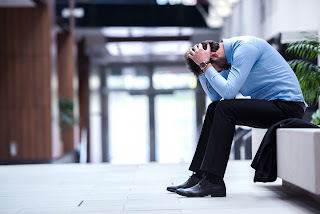 Realizing that your business isn't working can be heartbreaking. It can be embarrassing and demoralizing. After all, as entrepreneurs we thrive on challenge. It is very difficult to admit that you're not up to it. And the more you've defined yourself in terms of the business, the harder it is. Giving up your business can feel like giving up on a dream. It can literally be like a death in the family. I don't take that lightly. And I don't give the advice to quit lightly. But not quitting when you should can lead to all kinds of other problems - mostly financial. In talking to business owners all over the world, I believe about 90% of them can take the first four pieces of advice and create a great, profitable business for themselves. Ninety per cent of businesses that are going downhill can turn around. But that also means that ten per cent can't. Ten per cent have the wrong combination of personality, circumstances, and willingness to change. And for them, the best advice is to close the business and find something else. A certain number of people go into business when they really never should. They will be happier working for someone else, doing something else, and not worrying about all the details of running a business. I hope you're not in the ten per cent. But if you are, I hope you realize it and are brave enough to make the decision to move on. This is probably not the cheery message you expect at the end of the year. But some people need to hear this truth. One of my favorite groups to work with is BSM - Business Solutions Magazine. They are always looking at new perspectives and trying to figure out what the solution provider (VAR, reseller, MSP, SMB, etc.) world looks like. Here's the info on their latest adventure - for Independent Software Vendors and software developers. - ISV companies who attend the event will receive at no charge a Business Solutions marketing toolkit valued at $10,175. The toolkit will help ISVs reach both our channel audience and end user decision makers from our sister publications in the healthcare, field technologies, and retail verticals. Marketing activities include magazine and online exposure, email newsletter inclusions, a contact list of VARs or end users in markets you want to target, content syndication, and more. - All ISVs who attend will walk away with a $100 Visa gift card. We want to reward ISVs who share our belief in expanding their knowledge of the channel. - You'll learn how to distribute your software more widely through expert discussions about raising capital, partnering, and ISV marketing. ISV IQ Live! is not a hackathon and you won't be doing any coding at our conference. Instead, you'll spend a day learning from and networking with forward-thinking, growth-oriented software executives. If you have questions about this new event, please email me or visit www.ISVIQLive.com. Important news from SMB TechFest. 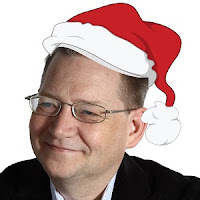 My good friend Dave Seibert has put together an amazing bunch of resources for small business IT Pros. 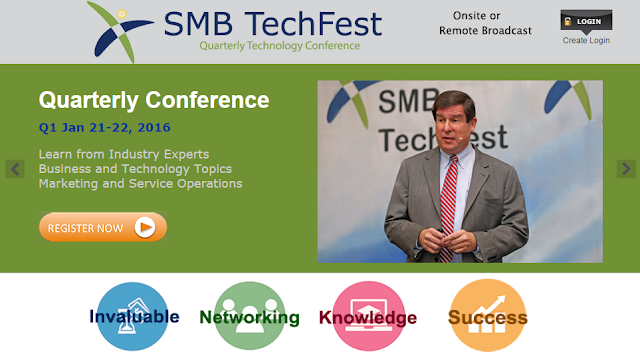 At a minimum, you should look at attending his four SMB TechFest events - live or via the Internet. I have been trying to hit one or two of these each year. I might even do all four in 2016. Whether you're looking for events, webinars, peer groups, or more, www.smbtechfest.com is a great place to start! 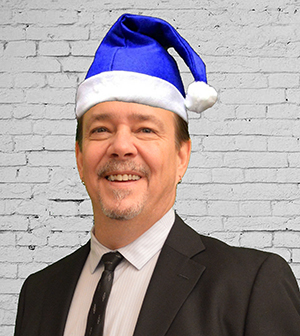 Dave Seibert has 35 years IT industry experience, 18 years running a multi-million dollar MSP and over 10 years of experience helping other partners in peer groups. during conferences about their solutions. including top picks from other partners. Make this the Last 30 Second Elevator Speech Ever! You've heard it a thousand: You need a 30-second elevator speech. That way, if you're trapped in an elevator, you can sell like a madman and sign a contract before you get to the bottom floor. We all know what that is. In my latest SOP Video, I talk about a truly useful approach to starting a conversation in an elevator (or at a BBQ or a Christmas party). Given that you're not going to make a sale in the elevator, how SHOULD you use that time? What's a meaningful conversation? And - most importantly - how do you train your staff to do the same thing? Check it out and give me your feedback. You can see all my videos at www.youtube.com/smallbizthoughts . I got a press release from my friend Jerry Koutavas over at The ASCII Group. As usual, they have a great line-up for their 2016 ASCII Success Summits. I've added all these dates to my weekly newsletter calendar. If you are not getting that click on the "Karl's SMB Email" link above to get on the list. Bethesda, Maryland – December 1, 2015 -- The ASCII Group, a membership-based community of independent MSPs, VARs and solution providers, is pleased to announce the upcoming dates and locations for its 2016 IT SMB Success Summit Series. With hundreds of events delivered over the years and thousands of connections made between Managed Service Providers and key industry leaders, the ASCII Success Summits 2016 are taking success to the next level. In eight different markets across the US, attendees will hear directly from fellow IT community members that are successfully driving managed services revenue in security and key vertical markets. The Success Summits made their debut in 2000, and have become the premier event for IT solution providers because of the model that The ASCII Group has successfully built their events around. Attendees have the opportunity to learn, hear innovative industry presentations, tour a cutting-edge vendor solutions pavilion, attend an exclusive member meeting, and most importantly network with their peers. A major highlight for the 2016 series is a rotating group of special guest speakers. First, ASCII has secured Steely Dan founder and former Doobie Brother Jeff “Skunk” Baxter, who is a prominent speaker at security conferences around the world and will speak at several Success Summits. Jeff’s life story is beyond interesting, remember when Elvis asked Nixon if he could be in the DEA? A rock musician with high-level security clearance – ridiculous. Unless, of course, you are able to outthink our nation’s enemies, with steely resolve. Only one such musician has the confidence and talent to step onto this world stage – Jeff Baxter. A consultant to the Department of Defense with a high-level security clearance in the Pentagon, he now advises top military and civilian groups on biological warfare, next-generation technology and unconventional strategies. Baxter’s unconventional process to problem solving can apply to business in a variety of ways, and attendees will learn how to outthink their competition and what it truly means to think outside of the box in business. Next, if you asked Ken Feinberg what his biggest challenge was in life, he would be quick to respond. Ken was tasked with the burden of determining restitution for the 9/11 victims. According to Ken, “What is an individual life worth? Do our lives have equal value? Struggling with these questions led me to my belief. After September 11, I confronted the challenge of placing a value on human life by calculating different amounts of compensation for each and every victim. The law required that I give more money to the stockbroker, the bond trader and the banker than to the waiter, the policeman, the fireman and the soldier at the Pentagon. This is what happens every day in courtrooms throughout our nation. Our system of justice has always been based upon this idea — that compensation for death should be directly related to the financial circumstances of each victim. But now I found the law in conflict with my growing belief in the equality of all life.” Hear his story on making the hardest business decisions on a national scale. The Summit Series is designed for qualified industry IT professionals and Managed Service Providers, and is targeted towards those who are looking to increase revenue and enhance their current business model. ASCII members receive free admission to the event. For more information on the ASCII IT SMB Success Summits 2016, including speaker information, a complete agenda, and registration, please visit www.asciievents.com. The ASCII Group is a vibrant reseller community of independent MSPs, VARs, and other solution providers. Formed in 1984, ASCII has more than 70 programs that provide turnkey cost-cutting strategies, innovative business building programs, and extensive peer interaction. ASCII members enjoy benefits such as marketing support; educational information; group purchasing power; increased leverage in the marketplace; and multiple networking opportunities. These programs enable ASCII members to increase revenue, lower operating costs, and grow service opportunities. Learn more at www.ascii.com or by calling 800-394-2724. 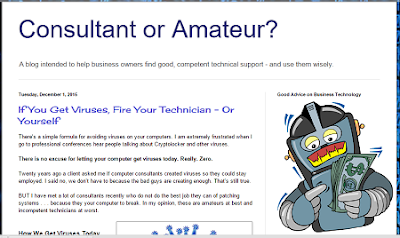 Awhile back I started a blog called Consultant or Amateur. It is intended for you to use with your end-user clients. I state right at the beginning that I am not looking for clients and readers cannot hire me. NOW is a Great Time to Change Your Passwords! What is Managed Services, Exactly? I have always believed that there are right ways and wrong ways to do things. Not necessarily one right way and one wrong way, but at least one of each. You right way may not be mine, exactly. But I'm guessing that general "best practices" in IT are pretty well agreed on. I encourage you to look through the site, subscribe to it, and send your clients there. For example, if you need a good argument for selling basic monitoring and patch management, my latest article on fighting viruses provides some excellent support. Because I'm talking to your clients as a total outsider, I can tell them things you can't. Like stop being a cheap business owner! That article, for example, advises that you can't get away with a cheap firewall anymore - and it costs money to stay in business. Of course you may not agree on everything. But that might even be better. Quote the paragraphs you like and send your clients there. You can even say I'm wrong about some stuff and right about others. Basically: Use this as a resource to convince your clients to take their technology (and you) seriously. If you can think of a topic I should address, let me know. I decided that I wanted to put on a webinar for end-of-the-year webinar to cover SOPs related to end-of-year reports you should run. But there's a lot to cover. And I wanted to leave time for questions. Then I thought it would be good to discuss some of these with Rayanne Buchianico and Manuel Palachuk. That was too much information and zero time for questions. 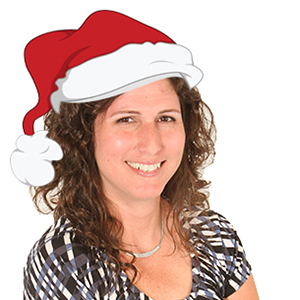 So I talked to Rayanne and Manuel and we came up with THREE end-of-year webinars. And we're doing them back to back. Click HERE to register for all three. Free. Karl is the author of 15 books, most focused on the business processes of technology consultants. His Managed Services in a Month is now in its second edition and has been the #1 book on Amazon for "Managed Services" for more than six years. Rayanne is the owner of ABC Solutions, LLC in Clearwater, Florida. ABC Solutions provides accounting, tax, and accounting systems consulting services to SMB IT companies throughout the United States. She is a community leader and one of the principle instructors for the Great Little Seminar series from Small Biz Thoughts. Manuel is the coach who will take you to the gym not just send you there. He believes that small business is the backbone of the world and the service industry in particular is the heart! Manuel has served as an in-house or outsourced COO for a variety of managed service providers. He is one of the principle instructors for the Great Little Seminar series from Small Biz Thoughts. We are very pleased to get together for this three-day event to help you get the most out of year-end 2015 and get a great start on a fresh new year. Join for a fun, informative three-webinar extravaganza. The last few SOP Videos (see www.youtube.com/smallbizthoughts) have been about the Monthly Maintenance Checklist. This week we cover the Monthly Single. What is a Monthly Single? Simply put, it's one single task that you perform across all your clients to make sure they are all guaranteed to have that thing done. For example, you might log into every firewall, backup the configuration to the server, apply all updates to the firewall, and back up the configuration again. Once you do that at every client, you can feel confident that there's one more thing you don't have to worry about. You will need to create a specific procedure for each of these Monthly Singles, and then store them in a place so you can find them and repeat them in a year or so. Some things (like testing backups) are critically important and need to be done every month. Others (like stress testing the UPS batteries) are important but only need to be done about once a year. The second group are good candidates for Monthly Singles. Enjoy the video - and don't forget to subscribe to my YouTube Channel! Got a note from my friend Jim over at Business Solutions. They are announcing a new conference for Software Developers. 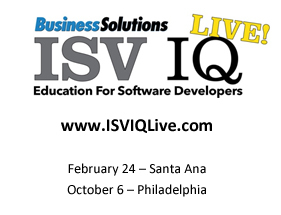 ISV IQ will be held February 24th in Santa Ana, CA and October 6th in Philadelphia. Details and registration links are below. From Jim . . . I'm thrilled to announce Business Solutions will host conferences exclusively for ISV/software developer executives in 2016. ISV companies who attend the event will receive at no charge a Business Solutions marketing toolkit valued at $10,175. The toolkit will help ISVs reach both our channel audience and end user decision makers from our sister publications in the healthcare, field technologies, and retail verticals. Marketing activities include magazine and online exposure, email newsletter inclusions, a contact list of VARs or end users in markets you want to target, content syndication, and more. All ISVs who attend will walk away with a $100 Visa gift card. We want to reward ISVs who share our belief in expanding their knowledge of the channel. You'll learn how to distribute your software more widely through expert discussions about raising capital, partnering, and ISV marketing. ISV IQ Live! is not a hackathon and you won't be doing any coding at our conference. Instead, you'll spend a day learning from and networking with forward-thinking, growth-oriented software executives. 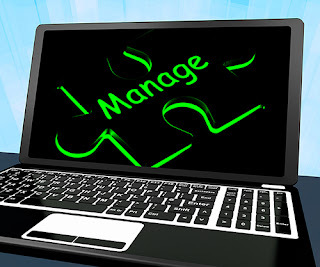 Monthly Maintenance Checklist - The Most Important Checklist in a Managed Service Business! My latest SOP video for Managed Service Providers is out! The topic is The Monthly Maintenance Checklist. In the last video (https://www.youtube.com/watch?v=jicDEqKfEBo) I gave an intro to the MMC. In the new video I go into some detail about what's included and why. Next week I'll go into detail on the "Monthly Single" mentioned here. If you want more details and samples, you can search for the word "Monthly" at www.SOPFriday.com and you'll see the full SOP blog posts for the MMC and the Monthly Singles. If you want a full ten-page description with samples of Monthly Maintenance Checklists for both Managed Service Clients and non-Managed Service Clients, you can find that over at SMBBooks.com here: http://www.smbbooks.com/SOPs-s/1857.htm. You might also want to pick up a FREE copy of the 68-point checklist at www.SMBBooks.com under the FREE section. There's a huge overlap between the 68-point checklist and the monthly maintenance because they both focus directly on the overall health of a client's (or prospect's) systems. So the things you'll check as a prospect's office will be the same things you check on once they're a paying client. Why? Because these are the most important things you need to focus on. Sorry to overwhelm you with links, but there you are. Have fun! P.S., In you want a super-deep dive into checklists, check out the class being taught by my brother Manuel and me starting November 24th: The Most Important Checklists for Any I.T. Service Provider. This course covers a long list checklists - with detailed examples and downloads. Details as always at www.GreatLittleSeminar.com. Who Wants Audio Books for Managed Services? I get asked all the time about audio versions of my books. So I am committing that this will be a major project of mine in the year ahead. The question is, which is first? And second? And third? Here is a short survey to find out which of these projects I should tackle first, second, etc. Name/email are optional. Please give your feedback so I know where to start. Personally, I can't imagine reading the contracts book without a disclaimer that you shouldn't read it while operating heavy machinery, but if that's what you want, that's what we'll do. The four-book set of SOPs will take some time. But once I start, I'll get them out as quickly as possible. I have already set up a room specifically for this project. I just need to know where to start! Thank you for your feedback and support! I go to a lot of conferences inside and outside the "managed services" community. I hear lots of great advice, some mediocre advice, and a small amount of bad advice. In the big picture, business advice is very much like personal therapy: You know what you need to do. Now you need to DO IT! There are always new strategies, new techniques, and new ways of looking at the world. And sometimes we need to hear the same advice 1,000 times before we're ready to act. But we're rarely surprised at the advice we get. So why do 80% of all businesses fail in the first five years? It's very simple: Business owners are not willing to work hard at the things that matter the most. Period. Someone in your company has to work really hard on the money. That means making sure that everything you do is profitable. It means knowing in some detail how much money you have in the bank, how much payroll costs you, how much you have in receivables, and what your cash flow looks like. If you don't have this in order, STOP doing whatever you're doing. Stop spinning your wheels, probably losing money, until you've figured out whether you're making money. I don't care if you hate money and never want to think about it. Your business WILL DIE if someone doesn't make money the highest priority. There's an old saying that you're losing money on every sale and you'll make it up in volume. Well, that's the road to "broke." If you are not going to totally master the flow of money into and out of your business, you need to hire someone who will. And you better trust that person, because if you refuse to pay attention to money, you'll never know if they're doing it right. First, let me piss off a few people. If you do not have a real Service Board (ticketing system) in the 21st century, you are an amateur. Service boards and PSAs (professional services automation) tools are everywhere and very reasonably priced. You don't have to manage your contracts in it, do your billing through it, or use it to manage inventory. Those are nice but not required. You DO HAVE TO manage service tickets through a good, modern service board. Why? Quite simply, service delivery is the single most important thing you do in your business. It is your business. I want to say that the Money piece above is the single most important piece, but without service delivery, there is no money. At the end of the day, you make money by trading labor (services) for money (whether hourly or flat fee/recurring). If you don't have a service board, the best you can do is get by. With a service board, you can track 100% of your time. Everyone throws out numbers about how much they bill and and how billable their technicians are. But if you don't track that in your service board, you're just guessing. And the "optimism bias" (Google that term) guarantees that you will have an incorrect assessment of how you're doing. Someone in your company needs to absolutely master the management of the service board. How many hours of labor flow into your company as service requests? How many hours are worked as effective billable labor? How do these numbers change over time? How many High Priority tickets are in your system? How many Low Priority tickets? How do you manage these to make sure everything gets the right amount of attention? Again, if you don't have the discipline and detail-oriented nature to manage all that, then you need to find someone who does. Make that person your service manager and let that person run the company - or at least the service department. I know you can do some of this with Excel spreadsheets and a good memory. But that's truly amateur stuff. If your "service board" consists of scribbled notes and remembering everything you're supposed to do, you aren't even an amateur. You're a hobbyist. The difference between having and not having a service board is the same as the difference between a brand new smart phone and a 1970's telephone tethered to the wall. Honestly. Without a good service board, you cannot run the reports to determine whether an employee is even paying for himself. You don't know whether any specific client or job is profitable. You think you know, but you don't know. You can't analyze your business in any meaningful way! I hear the same crap all the time: We're 100% word of mouth. Okay. Great. There is a natural limit to the size of any business that grows 100% by word of mouth - Because "word of mouth" really means someone else's mouth. Your mouth is the only mouth that matters. YOU have to be out there making appointments, making proposals, and closing business. If you're not selling your business, you have to know that no one else is either. You might be very happy with slow growth. I am. In my last managed service business, I grew the business to $950,000 through slow growth. It was manageable and profitable. I never signed up 10 new clients in a month. But that was my choice. But even with slow growth, I had to SELL. I had to make appointments. I had to do network assessments. I had to make proposals. I had to follow through. If you just wait for the phone to ring, it probably won't. You have to make the phone ring. That doesn't mean outbound sales calls, necessarily. You can run Robin Robins campaigns and get people to call you. But you have do something. And you have to work at it. Like everything else, if you're not willing to make sales, you need someone in your company who will. Hard Work Only Matters if You Work Hard at The Right Things! We can fill our days with low-priority tasks that will keep us busy for the rest of our lives. We can focus like crazy on the tech support we love. We can work hard at all the details of fine customer service. But the hard truth is that you have to put maximum focus on just a few things. Get the money right. Get the service board right. Get the sales done. If you take care of these things, everything else will follow. If you fail (or ignore) these things, your business will flounder. You might get away with being mediocre at these things for a long time. But you will never have a massively successful service business until you, or someone you trust, pays attention to money, service, and sales. 1. Are you . . . Loaning money to your business each year? 2. Are you . . . Giving yourself a regular paycheck every month? 3. Are you . . . Somewhere in the middle? If you answered #1 you are losing money every year. Get out. Go do something profitable. Or focus on the the important things even if you hate them. If you answered #3, you are probably losing money some months. At a minimum, you are not making as much as you should be. Again, focus on the hard work. Put money management, service delivery, and sales above everything else. Busy and productive are not the same thing. The hard, hard, hard truth is that most people know what they should be doing to be successful, but they don't have the discipline to do it. Just because you don't like something doesn't mean you can ignore it. What's in a Name? If It's Your Company, the Answer Matters! Whether you're a brand new company or well established, the name of your company matters. Thankfully, I think new business owners are less likely to give their companies "cute" names than they were 20 years ago. As always, I welcome your feedback there or here. You can subscribe to my channel at www.youtube.com/smallbizthoughts. I always use the name "Cousin Larry's Pretty Good Tech Support" when I need an example of a poorly run IT shop. So please don't steal that name! Mark your calendars and join me at the 2015 Channel Therapy Tour by ChannelPro SMB. As their marketing says, "We have the cure for what ails you!" I've been to a number of the ChannelPro SMB Forum events over the last few years. They are always informative, and I get to meet a lot of great people. The panels are very action-oriented and focused on changes you can make to improve your business right away. I will be talking about the central role of the Service Manager in building a successful business. Join me in New Jersey!! Give us one day and we'll send you home with the actionable sales, marketing, product, and operations advice you need to put your business on the path to a healthier bottom line. The ChannelPro SMB Forum is a full-day, live event featuring presentations from industry experts and some of the top SMB VARs, Managed Service Providers, and IT consultants in the country. Using an interactive format, presenters and panelists will share their insights on the hottest technology solutions in the SMB marketplace today. Each session opens with targeted educational presentations followed by an interactive Q&A discussion, or forum, that is led by a moderator to ensure a lively exchange. Attendees also receive numerous session-related resources, including white papers, analysis tools, and worksheets that add value to their experience. We will have dedicated time to visit with the channel's leading vendors and explore their solutions for your customers in the small business space. GEAR AND CASH GIVEAWAYS: Lots of chances to win big with gear and cash giveaways throughout the day! PLUS: There will be a technology area where you can have a hands-on experience with today's latest form factor gear, including tablets, ultrabooks, all-in-ones, and a variety of mobile solutions. The Basic Service Call: What's Your Brand? How do you perform service call? Seems straight forward. But I hope you don't "just show up" at a client's office. That doesn't help building your branding. You should have a standard approach to a visit in order to maintain quality and give the client a consistent, reliable experience. How do you prepare before you leave the office? What are your guides for onsite etiquette? You can watch all the SOP videos on my channel at www.youtube.com/smallbizthoughts. Please subscribe to the channel and you won't miss any! I'm a big fan of setting quarterly goals and then talking about them all the time. If your "evaluation process" is addressed once (or even four times) per year, people will never focus on these goals. They need to be reminded all the time. This is not a test! Don't make it feel like high school grading. The big picture here is that you need your entire team working on the same "big picture" goals. That's how you build culture and improve performance. Set quarterly goals and give constant feedback for maximum improvement. Building your brand - and help your employees move up to the next level. From there you can view my entire SOP playlist! The astute observer will note that I've started posting weekly videos on Standard Operating Procedures for Managed Service Providers. I've got about ten up so far and I'm posting one a week. You can always see the latest video on my You Tube channel at http://www.youtube.com/smallbizthoughts. I recommend you subscribe to that so YouTube will let you know when a new one is posted. There's also a "Playlist" of all the SOP videos, so you can dive in and see them all. SOP: Don't Answer the Phone! You should do things YOUR way. That means you have to have a "your" way to do things. You have to act with intention to create the company you want to own and run and sell to your clients. If you want a well structured, profitable company, you need to make that happen. I'm just throwing out ideas here. Joe Panettieri and Amy Katz are back! After a period of silent pondering, they have launched ChannelE2E — a site to help you on "your business journey from Entrepreneur to Exit (E2E)." I did a quick podcast with Joe last week in which he hinted at this. The hints make sense now. Listen to the teaser interview at SMB Community Podcast. Joe has agreed to a longer interview after the launch. Basically, the site is filled with content for Value Added Resellers, Managed Service Providers, Cloud Service Providers, and Total Service Providers. I recommend you start with the "Welcome to the Future." Joe and Amy spell out a clear evolutionary path for MSPs - and commit to helping you navigate the waters at every stage. Next, check out their description of the Five Stages of Your Business. That spells out their strategy for helping people at all stages. As the site explains, "Overall our theme goes something like this: We’ll bring you the best of our blog-driven insights. And we’ll also leverage data-driven, crowdsourced information to give you business insights. And of course, my opinions will spill onto our pages pretty darn regularly." There's quite a bit of content on the site, but you know there will be a lot more once Joe and Amy get cranking. So set aside some time and check out ChannelE2E. You can also follow Joe on Twitter here: @JoePanettieri. 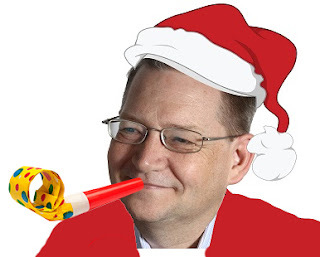 I got a memo from my friend Jim Roddy over at Business Solutions Magazine. If you want to attend the October 14 Smart VAR Summit in Philadelphia, you need to act fast. For more info on the event, and Keynote speaker Larry Walsh, visit the VAR Summit Website. Because we want every attendee at Business Solutions events to network with speakers and exhibitors, seating is limited for the October 14 Smart VAR Summit: Age Of Intelligence - IoT, Cloud, & Mobility Convergence, powered by ScanSource, Zebra Technologies, and Business Solutions. There is no charge to register, but only 37 complimentary passes remain for VARs and MSPs. The event will be held at Lincoln Financial Field, home of the Philadelphia Eagles. You can reserve your seat at: www.bsminfo.com/topic/smartvarsummit. The conference will cover the disruptive convergence of cloud, mobility, and IoT technologies. These three technologies are revolutionizing the channel and the NFL, and I think it's worth a day away from your business to learn about what's around the corner. Your complimentary registration includes parking, lunch, a keynote address from a nationally recognized channel research group, an end-user panel sharing candid insights, plenty of time to network with peers and exhibitors, and (weather permitting) a live on-field demonstration of Zebra's MotionWorks Sports Solution. For more information or to register for the conference, please visit the Smart VAR Summit website. Remember to reserve your space before registration is full. 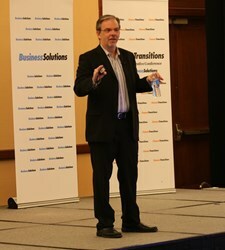 ALSO: If you want to see me at the Business Solutions Channel Transitions show in Chicago next week, you can register at http://www.channeltransitions.com/. We Donate with Every Sale! Managed Services Operations Manual - 1300+ pages in four books, plus downloadable bonus content. 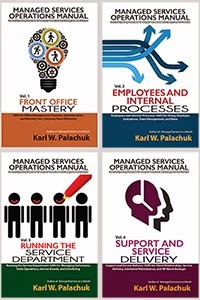 This four-volume set is the definitive guide to Managed Services. From the front office to the tech department, we cover it all. Every computer consultant, every managed service provider, every technical consulting company - every successful business - needs SOPs! When you document your processes and procedures, you design a way for your company to have repeatable success. And as you fine-tune those processes and procedures, you become more successful, more efficient, and more profitable. The way you do everything is your brand. Small Business project management is simply not as complicated as project management in the enterprise. But small business projects have the same challenges as enterprise projects: They need to achieve their goals effectively, on time, and within budget. They also face the same primary challenge – staying inside the scope of the project! 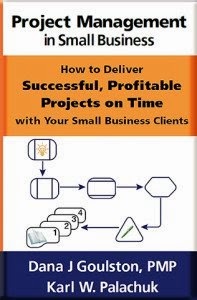 This great little book provides a simple process project planning and management process that is easy to learn and easy to teach to your employees, fellow technicians, and sub-contractors. You’ll learn to track any project, explain all the stages to clients and employees, and verify that everything is completed on time and under budget. The authors show you a great technique for making sure that scope creep is a thing of the past! Make every project a successful and profitable project! Includes chapters on cloud services in the Managed Service world. Order NOW and get started on a path to recurring revenue! Balance Your Personal and Professional Lives and Be More Successful in Both. Bringing balance into your personal and professional lives and becoming the person you want to be. SMBBooks.com -- for SMB Books! It’s that time again: Windows Server Summit 2019! Got WSUS 3 on SBS 2011? I make every attempt to honestly state what I believe and enjoy the freedom of posting whatever I feel like on this blog. This is a big complicated world and I have many interconnected personal and professional relationships. I may in some way receive money or other benefits from any of the products, services, or companies mentioned in this blog as a direct or indirect result of my actions on and off this blog. Any experience mentioned here is just my experience and I have no knowledge about whether it represents a typical experience with any products, services, or companies mentioned.